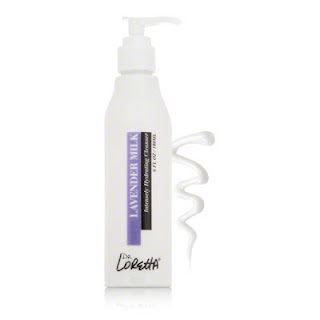 Rehydrate and cleanse normal to dry skin Lavender Milk is a super-hydrating and calming tissue-off way to avoid using water when you wash your very dry or sensitive skin. This is a wonderful alternative for people who use hard water (to avoid getting this on your delicate facial skin!). A great makeup remover for even waterproof eyeliner and mascara. This product is formulated with Vitamin E, Lavender Essential Oil and Aloe Vera to soothe skin while replenishing moisture. Designed for use with water or as a tissue-off cleanser. Formulated for dry, sensitive or mature skin. The bottle is also a plus because it has a pump instead of a squeeze top or jar like some of my other cleansers. I find pumps work best so you're not wasting any of the product and you get exactly how much you need. After a couple nights of usage, I realized 3 pumps worked just right for getting off all my makeup. Another thing to point out is the price, $19 for 6 fluid ounces. This bottle will easily last me a good 3 months, and under $20 for something I can use that long makes it that much more appealing. Cleansing milks in the past have left my skin feeling dry and tight, but Dr Loretta has created a cleanser that not only smells amazing but leaves my skin calm, more balanced and moisturized. I even felt afterwards a moisturizer was not necessary, something I've never said before about a face wash. Overall, I think all skin tones will benefit from the Lavender Cleansing Milk. The only people who might not find the Milk Cleanser is for them is people who dislike the scent of Lavender, but really who couldn't love such a beautiful smell? Dr Loretta's Lavender Milk Cleanser is available now at Dermstore and other online retailers for $19. I've used the product before and the scent is very light and soothing. Not very floral at all. GREAT for winter weather and for sensitive skin types! Great article!! And amazing cleanser!! It's one of the gentlest I've ever used. My skin feels clean and soft, the scent is light and natural. I have very thin skin and it becomes irritated with too many chemicals, this cleanser is the right balance of soothing and cleansing. My face says thank you!! !